All topics pertaining to the temperament / character of the Tamaskan Dog. I am doing research on Tamaskans as a potential breed to own in the future. I currently own 2 sled line huskies, a show line husky, and a husky gsd mix. I love nordic breeds, and really enjoy the trainablitiy of my husky/gsd mix but she's a rescue and has issues with fear based reactivity and touch sensitivity that leads to bite risk. I love huskies dearly, their independent streak can make them difficult. 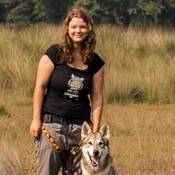 Online descriptions of Tamaskans say they are trainable, social, workable, develop strong bonds with family, but in talking to other friends in the dog world that we are really active in (showing, sporting and training), they are saying that all the ones they have met have been extremely nervy. Fearful of people and new situations, prone to bolting if off lead, lots and lots of anxiety. even reading on here I am seeing high instances of separation anxiety and that most of people's dogs here are quite young so no one really knows what their dogs temperaments will be once matured. I guess I am looking for people experience with matured tamaskans, both breed in the US and internationally, if their dogs are a nervy mess or confident and to what degree? I really don't want a dog that eats walls and bursts out of metal kennels or that i can't take traveling and hiking since I'm a photographer and have to travel regularly for work. I would also need the option that the dog would be okay and happy if I had a family member care for it. Re: Low Confidence? Fearfulness? Nervy? As Sylvaen mentioned, it depends on lines and individual dogs. It is best to talk to the breeder. Only have one adult Tamaskan Dog, and she was from a White Swiss Shepherd outcross litter and has no detectable (Embark) wolf content. I have found her to be very focused and trainable. She is easy off leash when hiking and recalls well. She loves dock diving, scent work, and hanging out with children that want to read to her. Now, She isn't perfect either. She loves kids, cats, dogs, and most adults. I do say most adults. During our dog outings with various groups, we do note that she has a slight fear of cowboys/cowgirls, mainly an issue with hats casting a shadow on a person's face as they approach her. We are working on that one. During our dog outings with various groups, we do note that she has a slight fear of cowboys/cowgirls, mainly an issue with hats casting a shadow on a person's face as they approach her. We are working on that one. Hmmm that's interesting... one other pup has a fear of people wearing baseball caps. It gives me a good idea though: to host a "funny hat" puppy party to get them used to people wearing all different kinds of headgear. Having said that I do know seperation anxiety is a higher risk in this breed, but that's not linked to general anxiety/fearfullness in my experience. My own girl suffered from seperation anxiety but was otherwise the most stable, relaxed and confident dog I have ever known. She was friendly to everyone, loved to meet new people and get cuddles from them. I would take her everywhere with me in the car and public transport, we could go to events with 100dreds of other people and dogs and she was perfect. Other dogs would be leash reactive and snap at her, she would barely blink an eye. She has done professional photoshoots, starred in an medieval open theater play (with dressed up people, stage props, sound/fire effects, other dogs, horses and sheep) and a tv-series. The only time she really had a fear resonse was when someone lighted fireworks (the loud bang kind) near to us when we were walking on the streets. It was totally unexpected and even I jumped in the air. Still she calmed down in a matter of minutes and it did not affect her afterwards (she never developed a fear of fireworks and was super cool each year with new years).